The Phoney War took place between September 1939 to April 1940 and was the British term used for the 6 months prior to the start of the war. This was following the Blitzkrieg attack on Poland which is claimed to have started World War 2. It was seen as a period of time where preparation for the impending war was done. There’s two arguments as to whether the benefit was for the British homeland or whether it helped the German army regroup after his victory in Poland. 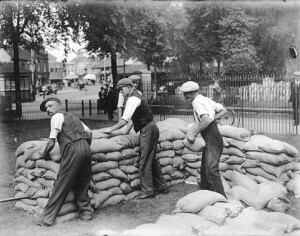 It was a conflict ultimately ran by civil servants as opposed to the troops of Britain however it gave Britain time to create home protection including 400 million sandbags around shops and public buildings, the handing out of over 38 million Gas Masks to name just a few. The British Army however did advance into France on the 11th of September a week after the fall of Poland. But with only 150,000 men and 25,000 vehicles they didn’t feel comfortable in attacking a Nazi army. As mentioned above following this advance the British dug in on the Belgian border and began making the preparations at home. The period was seen as a confusing one for those who lives in Britain as they expected a war at any time. It is claimed that London Zoo went as far as putting down on their poisonous snakes in case they escaped during the bombing raid. Britain were very much prepared for an attack; maybe too prepared! By the Spring of 1940 it is estimated that millions of people decided that the war wasn’t going to happen and they began walking the streets without Gas masks. The fear of the impending war began to subside. This however was short lived when suddenly on the 9th April 1940 the war began again. This period essentially proved to be fruitful for Hitler as he was able to regroup following the victory in Poland. He then launched an offensive on Norway and Denmark which well and truly announced the start of the war.